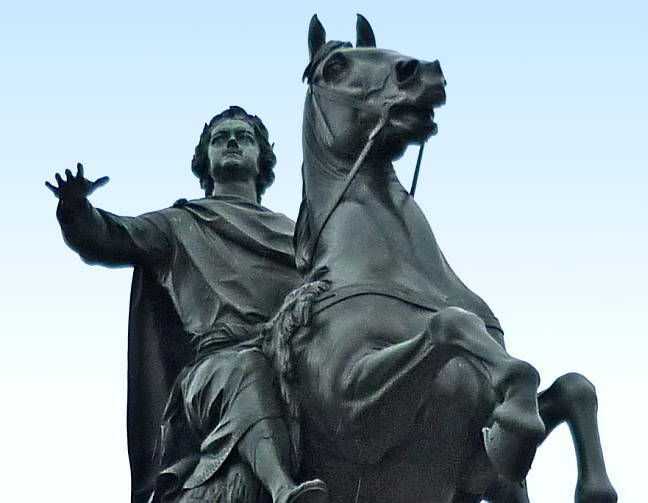 Natalia Popova calls this monument Falconet's "most immaculate work of art" (36), and it certainly influenced Sir Richard Westmacott's equestrian statue of George III in Windsor Great Park, and thus the whole fashion for equestrian statues in Victorian Britain. According to Uwe Geese, Falconet's model was ready by 1770, but "eight more years and two unsuccessful attempts at casting" followed (254). The technical problems involved were enormous, as Westmacott too would find. 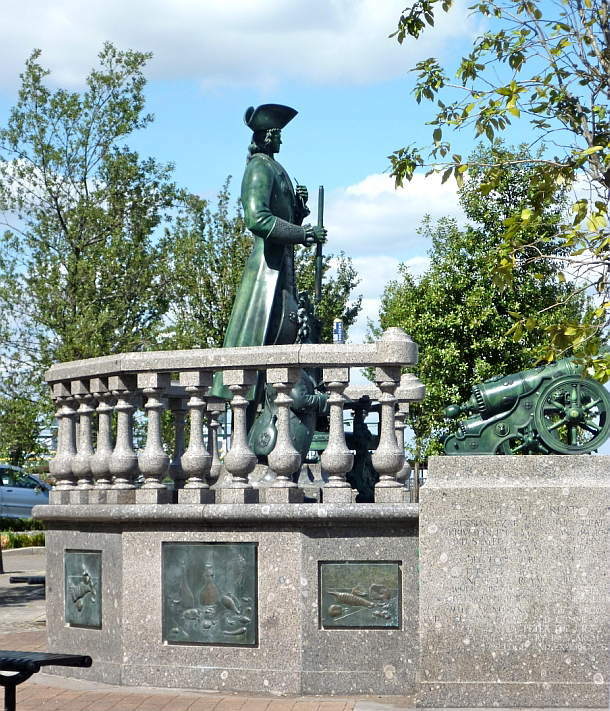 Falconet's Baroque monument makes an interesting comparison not only with Westmacott's thoroughly English equestrian George III, but with a contemporary Russian monument to Peter the Great in Deptford, south-east London, where the young Tsar came to study the art of shipbuilding in 1697. Of course, this later work by Mikhail Shemyakin (b. 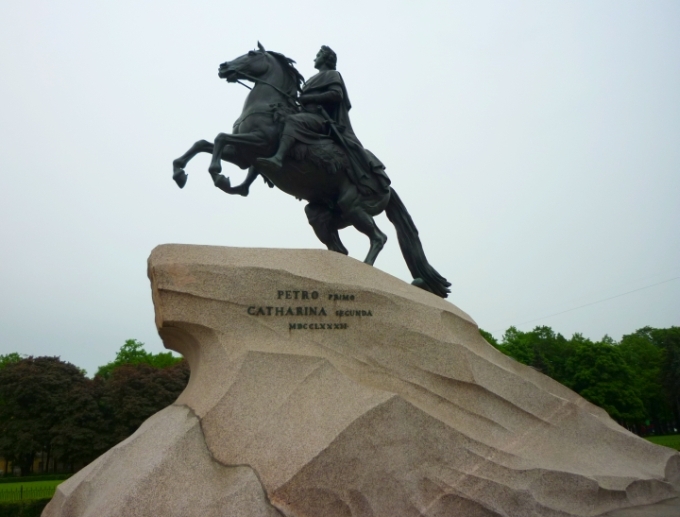 1943) relates to a particular episode in Peter the Great's life, and the lack of reverence is to be expected now. 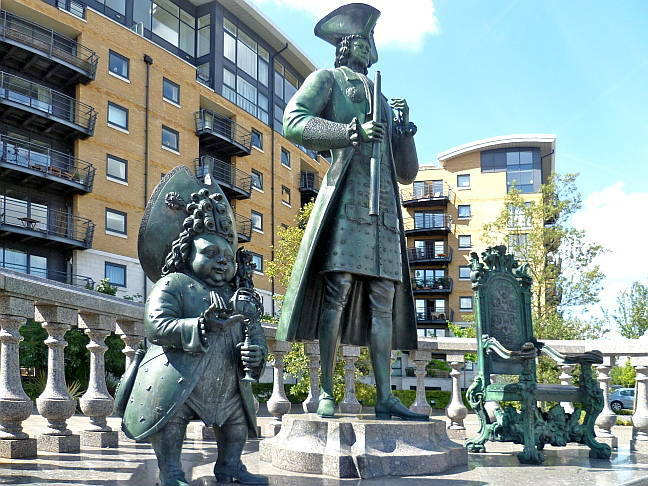 More mundanely, Shemyakin's courtier-Tsar stands on his own two feet in front of the Thames, holding a pipe in one hand, and a telescope in the other. But there is something bizarre about his elongated figure, shown with his dwarf servant on one side, and an ornate throne on the other. A couple of cannon complete the ensemble on a raised, balustraded platform, reminiscent of a bandstand. This speaks volumes about changing attitudes both to royalty and portrait sculpture in the west. Bullus, Claire, and Ronald Asprey. Statues of London. With photographs by Dennis Gilbert. London &: New York, Merrell, 2009. Geese, Uwe. "Neo-Classical Sculpture." Neoclassicism and Romanticism: Architecture, Sculpture, Painting, Drawing, 1750-1848. Ed. Rolf Toman. Cologne: Könemann, 2000. 250-317. Popova, Natalia. St. Petersburg and its Environs. Trans. Gillian Kenyon. St Petersburg: P-2 Art Publishers, 2007.